Friend of Kim Jong-un and former basketball star, Dennis Rodman of the Chicago Bulls, has said that he plans to invite world renowned artist Kanye West to North Korea on his next trip. Following on from the successful Singapore Summit last month between Donald Trump and Kim Jong-un, which focused on the denuclearization plans of the Korean peninsula. People everywhere have felt that it had been a monumental step towards world peace, easing relations and perceptions of the once vilified North Korean leader in the mainstream media. Democrat and liberal tears flowed even further once they saw that Donald Trump and Kim Jong-un already had a successful summit, and reportedly had a successful deal done months prior, which now paves the way for other stars apart from Dennis Rodman to visit the region in the future, if they should be invited. 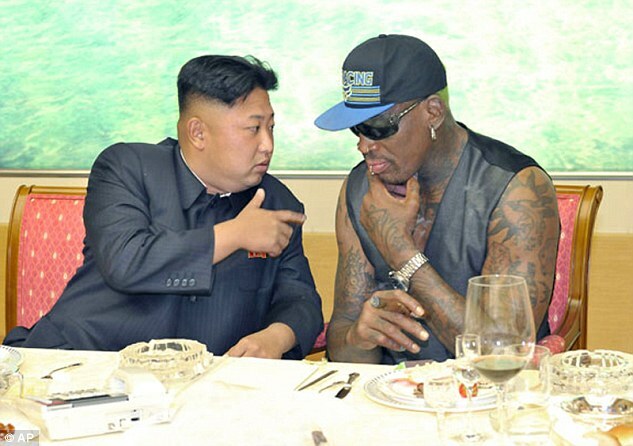 Rodman was no doubt an additional communication vehicle throughout by being friends with the North Korean leader years prior to the Singapore Summit, which could very well enable celebrities like Kanye West to visit the region some day. Kanye West, as you may recall, teamed up with political speaker Candace Owens not long ago to break the liberal matrix of divisional lines and racial segregation on the Democrat plantation, sending the establishment media and the cabal into another media smear campaign against Mr. West, calling him “crazy” amongst other dismissive accusations. Only TMZ stepped in and tried to help Kanye West to be heard, although, their scripted efforts to shun him also applied, but instead, it very much backfired for the entertainment network. Kanye West encourages “freedom of thought”, and that’s the last thing that the establishment wants the public to be able to do, amidst fake news and media propaganda. However, Kanye’s efforts were a success in shattering the liberal bias and the entertainment world’s thought police antics for the whole world to see. Brilliant! Kanye West’s support of Donald Trump has also opened many people’s eyes to get away from the “victimhood” plantation of the leftist agenda. Kanye West is a Chicago native and a big fan of the former basketball star, presumably for how he always conducted himself as an abstract sports entertainer, on and off the court, which may also make it no surprise that Rodman eventually struck up one of the unlikeliest friendships with Kim Jong-un. Kanye West and Dennis Rodman both met at a BLM rally in Washington D.C. back in March, where they bonded over Chicago, a place that’s changed immensely over the years of Democrat rule. Their encounter was a couple of months before Kanye West spoke out publicly of his support for Donald Trump again, plus some months before the Singapore Summit, for which Dennis Rodman helped to lay an initial groundwork in being a friend of both Kim Jong-un and Donald Trump. Plus, who could forget Dennis Rodman’s passionate display on CNN where he called out Barack Obama for ignoring him regarding North Korea? Will Kanye West one day travel with Dennis Rodman to North Korea in order to meet Kim Jong-un? Only time will tell… Well, why couldn’t they just enjoy a trip to South Korea or even Singapore at the same time? Very positive and stranger things have seemingly already happened, so who knows?